25 sheet punch capacity. Unique, gravity fed, low force paper punching makes binding documents easier and faster than ever before. I really like that they take part in the punches in a progression rather than all at once. This allows for much less pressure to pull the lever. Pages are easily punched with very little pressure on the lever. It works well. My only problem was that the starter-set of supplies were not all usable. As for the binding system, it was precisely what we needed. Firm Administrator Review by Patrick B. Love our new binding machine! Not only is it sleek and efficient but it works for left handed and right handed staff members (of which we have both)! We are very happy with this purchase - thank you! Welcome to MyBinding video. This is the Swingline GBC CombBind C340 Comb Binding Machine. Using it is really easy because the instructions are right on the front. First measure out all your pages so you know which binding to use. The color coordinating makes this process easy. Next, place your binding comb into the comb opener. Pull the small lever on the side to open the teeth of the comb. Before punching, adjust which size paper you'll be using. Then, place up to 25 sheets of 20 pound paper into the punching slot. Pull the larger lever to make your punches. The C340 can bind up to 500 pages into one book. After punching, place your sheets face down into the binding comb. Once all your pages are in, close your binding up and your book is ready. This machine has a great mix between heavy duty and portability. And don't forget to remove the bottom tray to throw away the trimmings. This is the Swingline GBC CombBind C340 Comb Binding Machine. For more demos, reviews and how-to's, go to MyBinding.com. 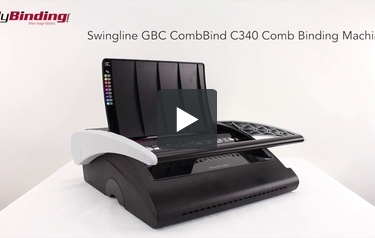 The GBC CombBind C340 is a newest, manual, plastic comb binding machine available from GBC. The CombBind C340 offers a new, stylishly designed manual punch and other features completely unique to any other plastic comb binding machines. Because of this, and other important factors, the C340 promises to make your binding projects both quicker and easier. The GBC CombBind C340 has a variety of unique and useful features, including a document separator The document separator works to speed up punching by separating pages into perfect sections every time. In addition to this technology, the CombBind C340 machine also uses auto-centering technology. This feature can saves a great deal of setup time by eliminating the need to set the paper edge guide before punching. Time-savings features like these are definitely worth their weight in gold - or at least, in productivity. With a 25 sheet (or more accurately, 22 sheet), punching capacity, it is one of the largest punch-capacities offered by a manual comb-binding machine. This is another highly-desired feature that help the C340 stand out from the crowd. But the features don't end there; the CombBind C340 is made with an ergonomically designed handle. This handle works for those who are left handed or those who are right handed, makes the C340 completely functional to operate for any personnel. While there are several nice features included in the C340, there are also some limitations. To begin with, there is no depth-of-punch guide. This is critical because without it, you can't choose the distance of the holes from the edge of the paper. In addition, there are no disengageable dies. These disengageable dies allow the machine to punch custom sized sheets. The C340 also is without an open throat design, making it unable to punch legal or A4 sized documents. This does limit the versatility of the machine and should be kept in mind when making your decision. There are other limitations associated with a manual punching mechanism. Because of its manual punch, the volume that the C340 can handle is limited. This makes the CombBind C340 unsuitable for high volume applications because of the time and inconvenience a manual operation presents. Finally, although the rotary comb-opener design is functional, it's not as easy to use as the traditional comb opener that uses a handle for operation. This can also add time and aggravation to certain projects and applications and again, should be kept in mind when making a purchasing decision of this kind. The GBC CombBind C340 is fine for occasional use, but it is primarily made of plastic. This makes the machine less durable and therefore, could potentially need replacement much sooner. There are however, some desirable design traits on this innovative machine. The CombBind C340 has several new features such as a document separator and an auto-centering guide, which are helpful to the binding process. These are the kind of features that many small to midsized organizations are looking for and the ComBind C340 delivers. The CBC CombBind C340, while not ideal of very large corporations with high volume needs, could be perfectly suitable for small to medium sized operations with lower volume needs. So, even though there are some definite limitations with the CombBind C340, there are also some unique features that aid in style and functionality. Because of this, the GBC CombBind C340 can be a good choice for routine comb binding and is recommended for that use. With its plastic construction and other limitations, however, it is probably not ideal for higher-volume applications and could not stand up to the challenges of durability and speed that these organizations are looking for. Jeff McRitchie is the director of marketing for MyBinding.com. He writes extensively on topics related to Plastic Comb Binding Machines, Binding Covers, Bookbinding Supplies, Binding Machines, Binders, Index Tabs, Laminators, Laminating Pouches and more. What would you recommend for a elementary school use for a CombBind that is used a lot. And can a person take the screws off and take the bottom off and clean out the machine of the little pieces of paper that are caught in the machine. Thank you for your question. The Swingline GBC C340 Plastic Comb Binding Machine is a popular machine with schools. It has many user friendly features to help make it easy to use. The CombBind C340 is solidly built, but it is primarily made of plastic. This makes the machine less durable and therefore, could potentially need replacement much sooner. It does have a drawer to remove paper waste but is not designed to be disassembled.